Microgaming is among the first online slots developers to secure major licenses from Hollywood. The company has developed many major film adaptations, and the movie companies are increasingly open to the idea of approving slots machines and other software based on their blockbuster properties. 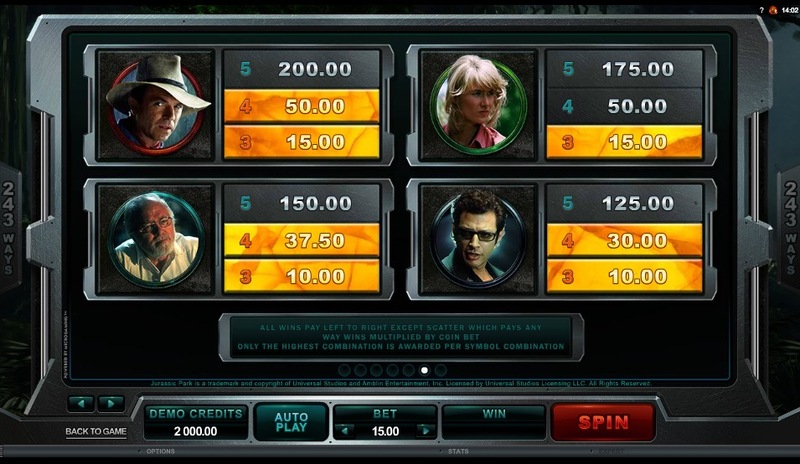 One of the most recent blockbusters to have a high-profile slot game attached to it isn’t new at all but rather a Steven Spielberg adventure classic—Jurassic Park. Microgaming is bold this way. The developer isn’t afraid to take an older property and reintroduce it to audiences in a new and exciting way. In fact, this approach is one of the reason Microgaming has so many dedicated fans. 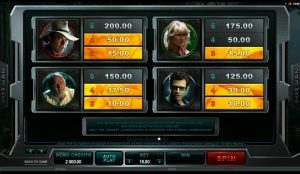 Although this is an “old” film, the slot machine itself is quite modern and boasts a lot of great features as well as free arcade mode. Jurassic Park the movie is a film about dinosaurs but really about people. 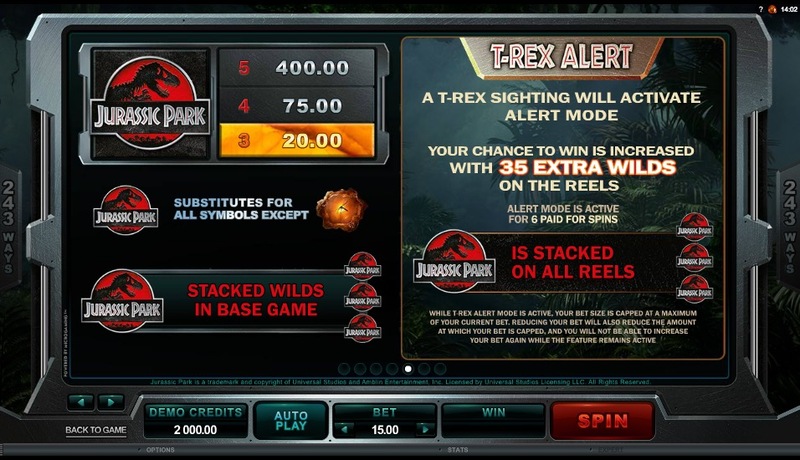 Jurassic Park the slot machine, on the other hand, is very much about the dinosaurs. Arguably, the most important symbol is the T-Rex, which is certainly a character you wouldn’t want to encounter in real life. Here in the game, however, it proves to be rather useful. It even shows a friendly side and can be a fortune teller of sorts. How’s that? Well, the T-Rex symbol triggers a red alarm, and when that happens, the reels fill up with wild symbols. The exact number is random each time, but 30 wild symbols isn’t uncommon. How does this affect the player? It translates to a lot of wins, and just how much you win depends on the size of your bet. Put a sizable bet down, and it’s pretty easy to walk away with thousands and more when a red alarm strikes. The free arcade mode is, of course, just a demo. You’ll have to play with real cash to actually win money. In either mode, the game provides a fun and insightful look into the world of Jurassic Park. 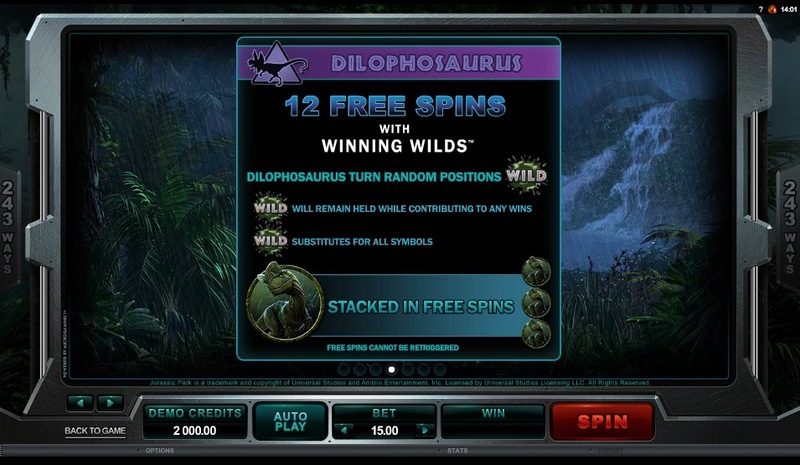 The game also boasts features that keep the excitement high, such as free spins, which are common to Microgaming slots. 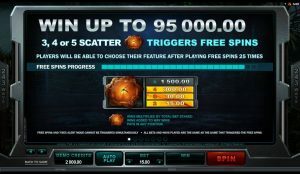 Setting off the free spins is as simple as hitting three or more amber symbols. These and the other features are a matter of chance and can show up on any spin no matter the bet amount. 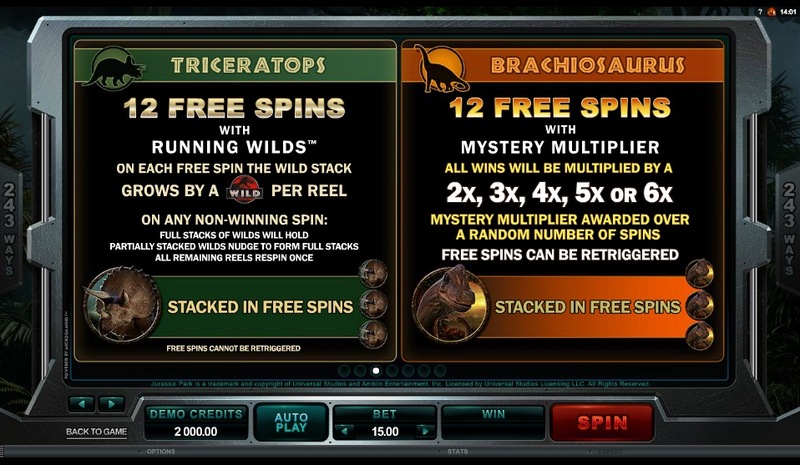 There are 243 ways to win each spin. You don’t choose the number of paylines to activate like you do with some games and instead just select an overall bet. 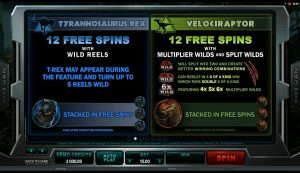 The maximum bet is quite high for those players who welcome the risk, and an auto-play feature lets you kick back and relax. With auto-spin, there’s no need to spin each round—the game automatically pauses after wins, or you can pause whenever you need a break or are finished for the session. The game has many different symbols each with its own unique value. The bigger the value of the symbol, the less often it appears. However, the low value symbols can help you break even and stave off any losing streaks. 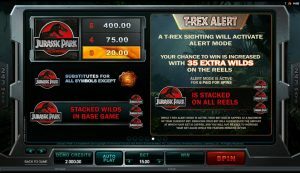 The T-Rex, for instance, can be worth as much as 75 coins, and how much you win will depend on the coin size you chose. There are also symbols that don’t award coins but rather initiate bonus activities. Three mosquito symbols, for instance, award you free games with a choice. 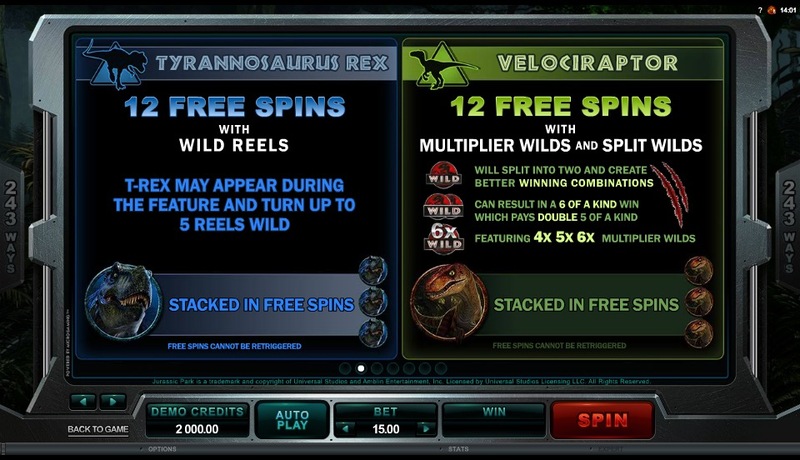 There are different styles of free games each with their own special features, and your choices determine how the bonus round plays out. 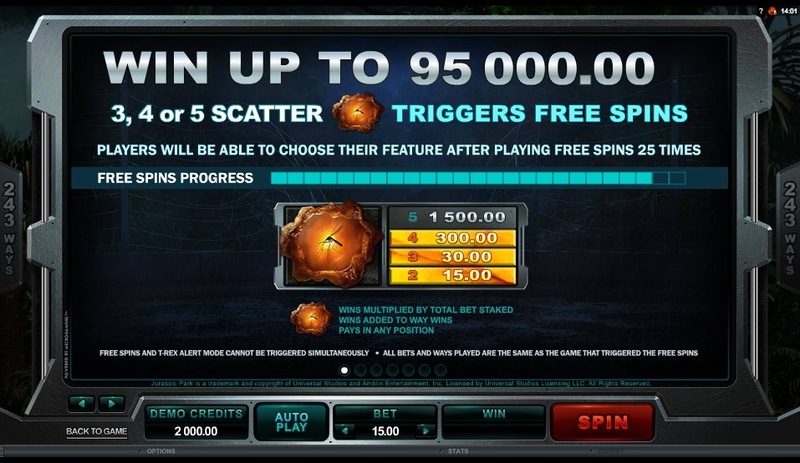 These features include multipliers, which can increase the top payout for a spin by a considerable amount. 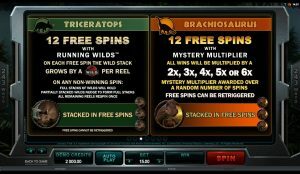 Microgaming has developed many licensed slots games over the years and continues to release more, and Jurassic Park remains one of the best. The game is versatile and profitable and provides enough action and diversity that fans keep coming back time and again. If you’d like to experience this game firsthand, be mindful that you can do it without risking actual money. 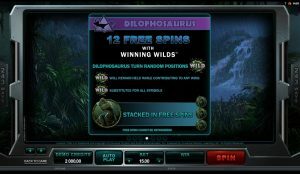 SlotsClub.com features Jurassic Park and many other games that you can play at no cost and without risk.